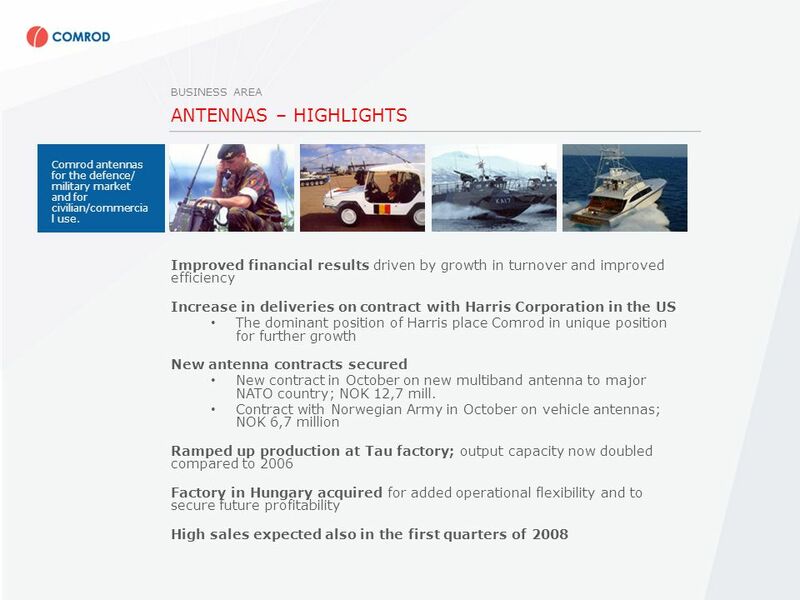 15 ANTENNAS – HIGHLIGHTS Improved financial results driven by growth in turnover and improved efficiency Increase in deliveries on contract with Harris Corporation in the US The dominant position of Harris place Comrod in unique position for further growth New antenna contracts secured New contract in October on new multiband antenna to major NATO country; NOK 12,7 mill. 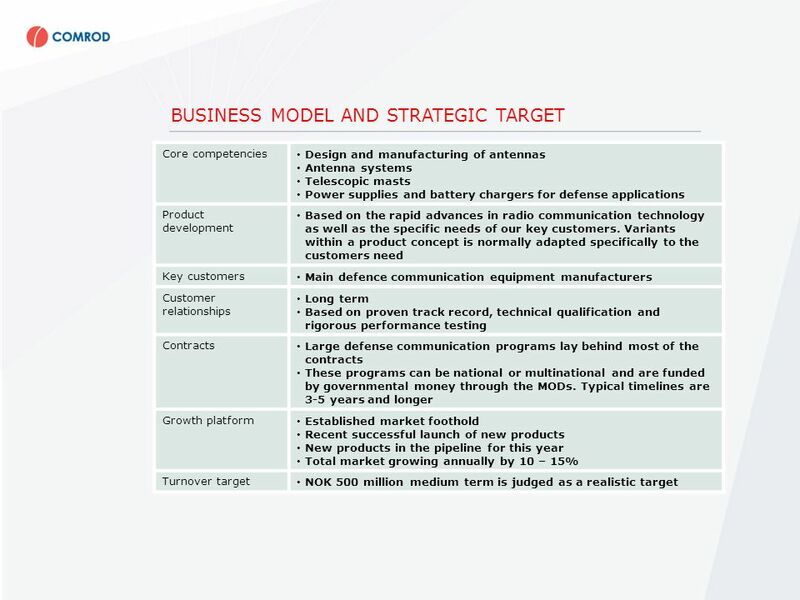 Contract with Norwegian Army in October on vehicle antennas; NOK 6,7 million Ramped up production at Tau factory; output capacity now doubled compared to 2006 Factory in Hungary acquired for added operational flexibility and to secure future profitability High sales expected also in the first quarters of 2008 BUSINESS AREA Comrod antennas for the defence/ military market and for civilian/commercia l use. 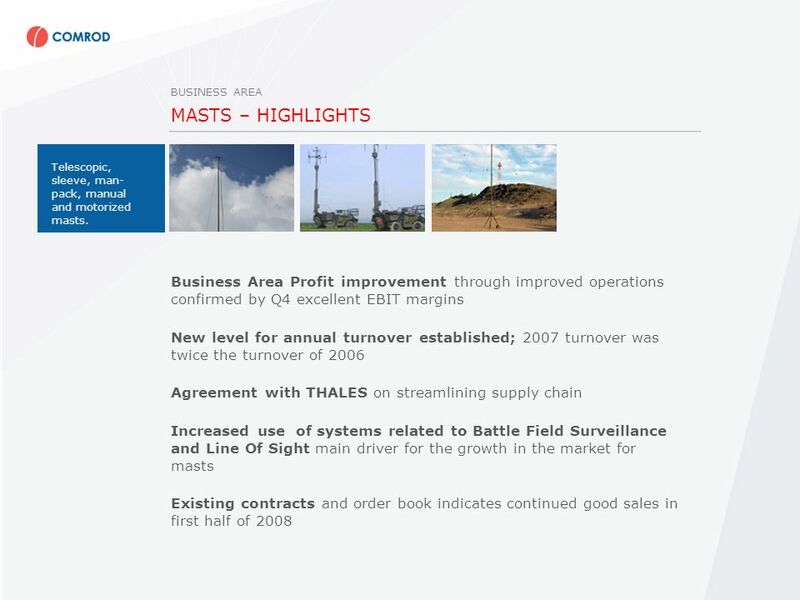 16 MASTS – HIGHLIGHTS Business Area Profit improvement through improved operations confirmed by Q4 excellent EBIT margins New level for annual turnover established; 2007 turnover was twice the turnover of 2006 Agreement with THALES on streamlining supply chain Increased use of systems related to Battle Field Surveillance and Line Of Sight main driver for the growth in the market for masts Existing contracts and order book indicates continued good sales in first half of 2008 BUSINESS AREA Telescopic, sleeve, man- pack, manual and motorized masts. 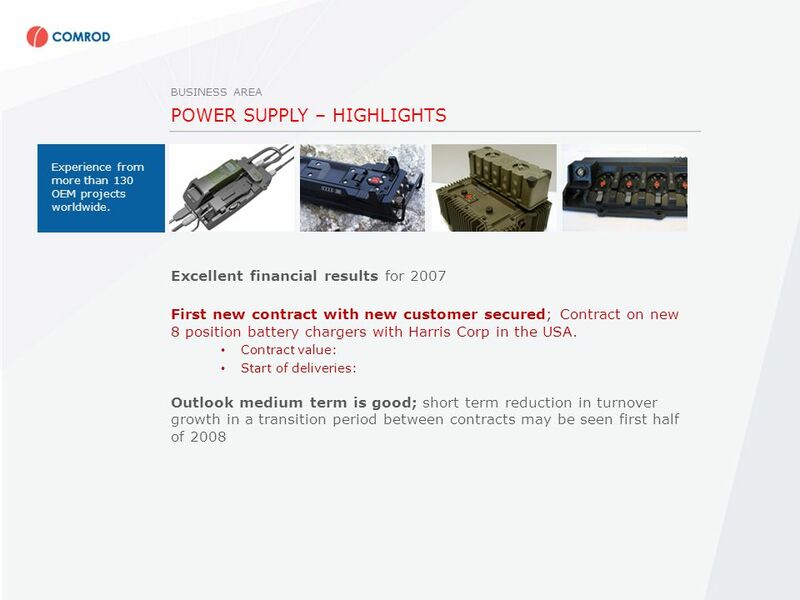 18 POWER SUPPLY – HIGHLIGHTS Excellent financial results for 2007 First new contract with new customer secured; Contract on new 8 position battery chargers with Harris Corp in the USA. 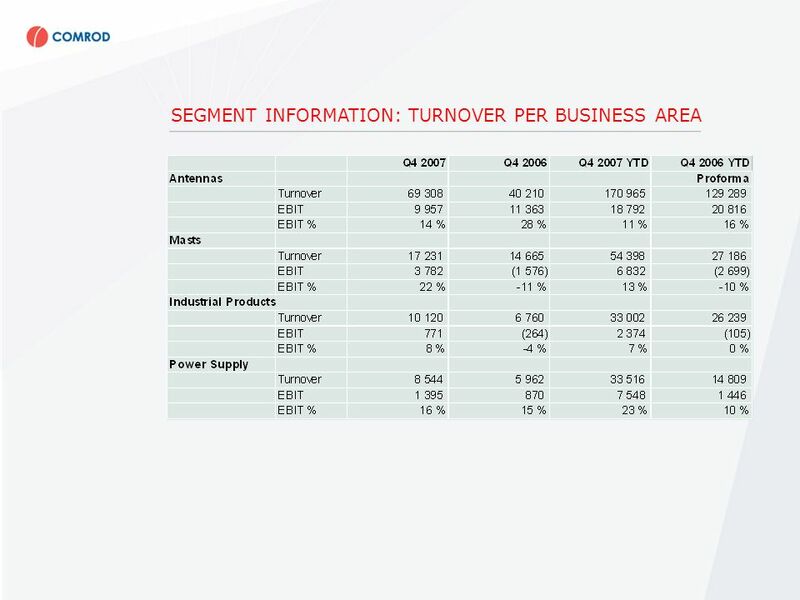 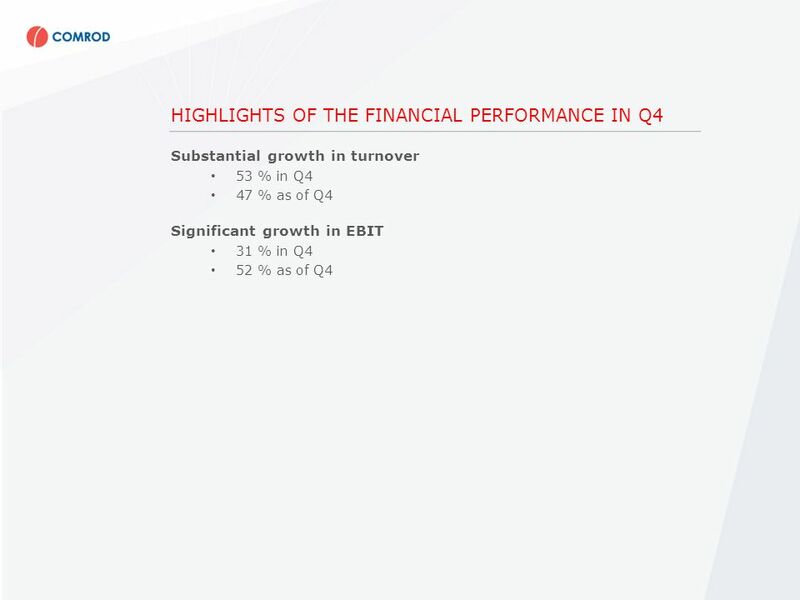 Contract value: Start of deliveries: Outlook medium term is good; short term reduction in turnover growth in a transition period between contracts may be seen first half of 2008 BUSINESS AREA Experience from more than 130 OEM projects worldwide. 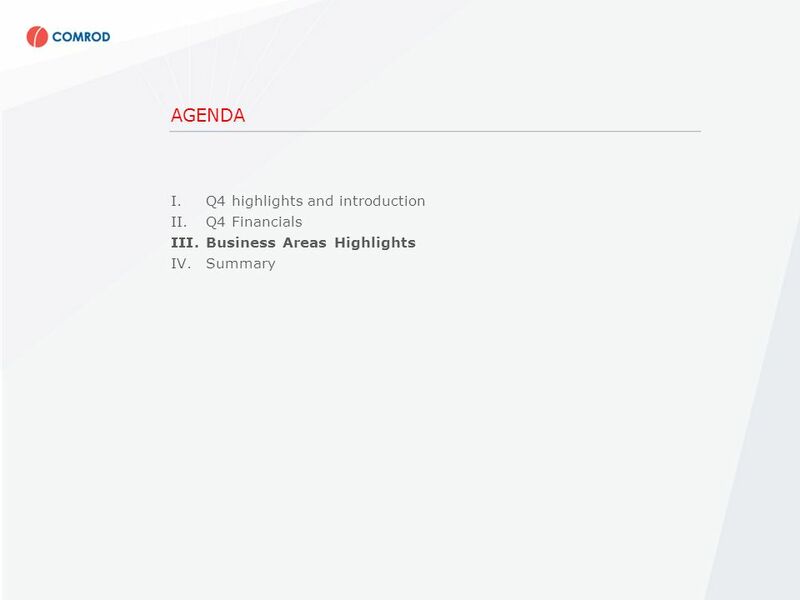 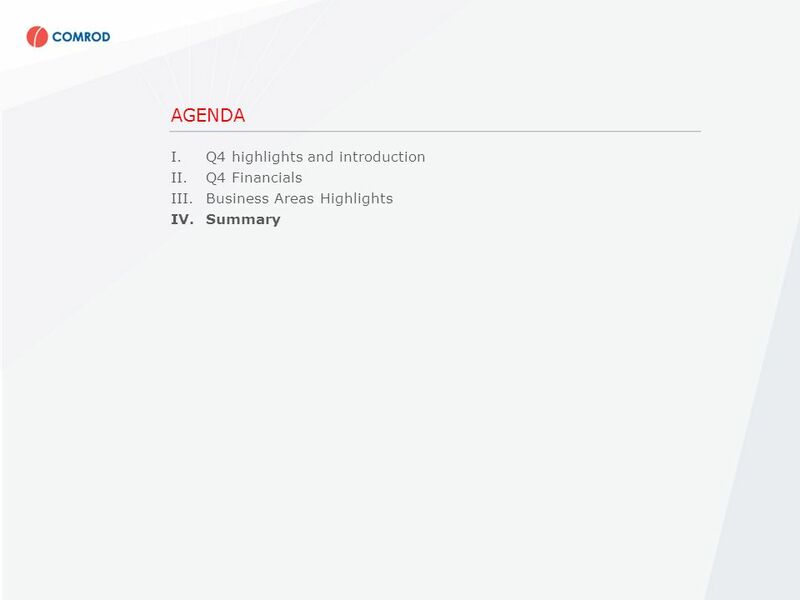 Download ppt "Oslo, 13th. 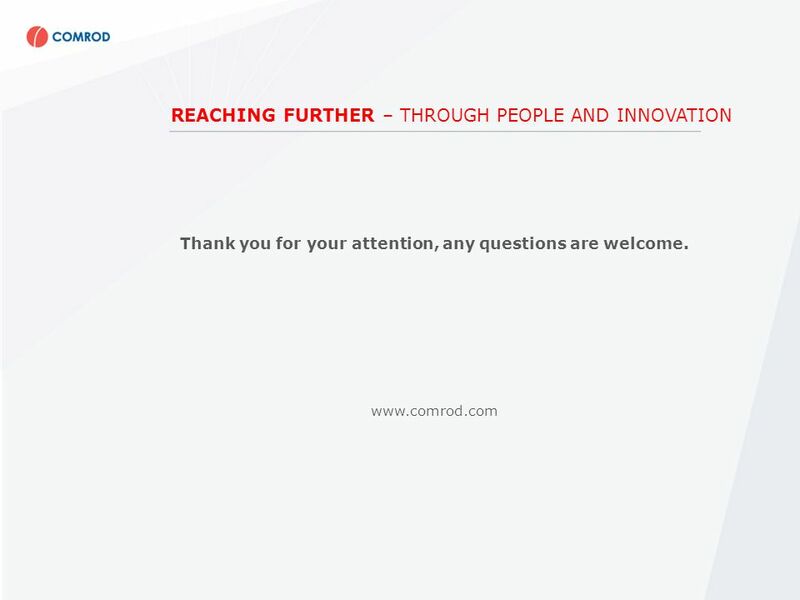 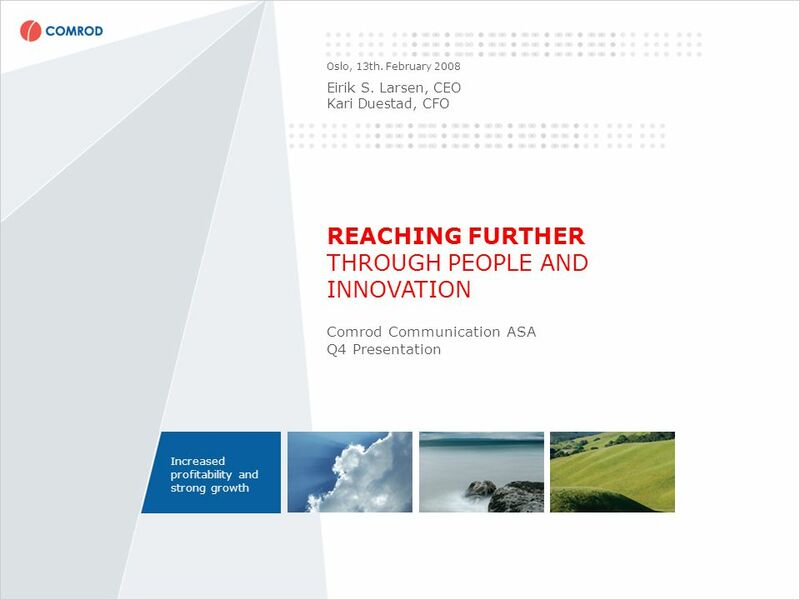 February 2008 Eirik S. Larsen, CEO Kari Duestad, CFO REACHING FURTHER THROUGH PEOPLE AND INNOVATION Comrod Communication ASA Q4 Presentation." 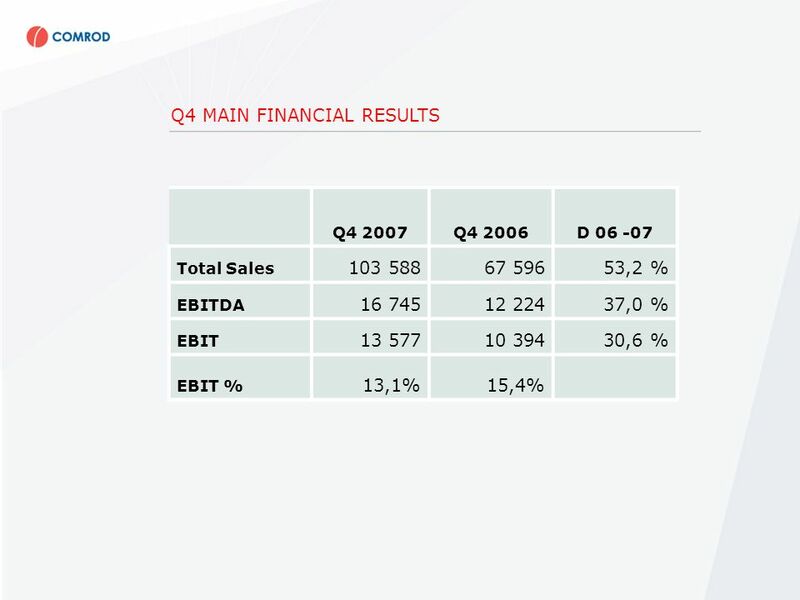 AXIS Communications A world of intelligent networks Third quarter 2001 CEO Peter Ragnarsson CFO Jörgen Lindquist. 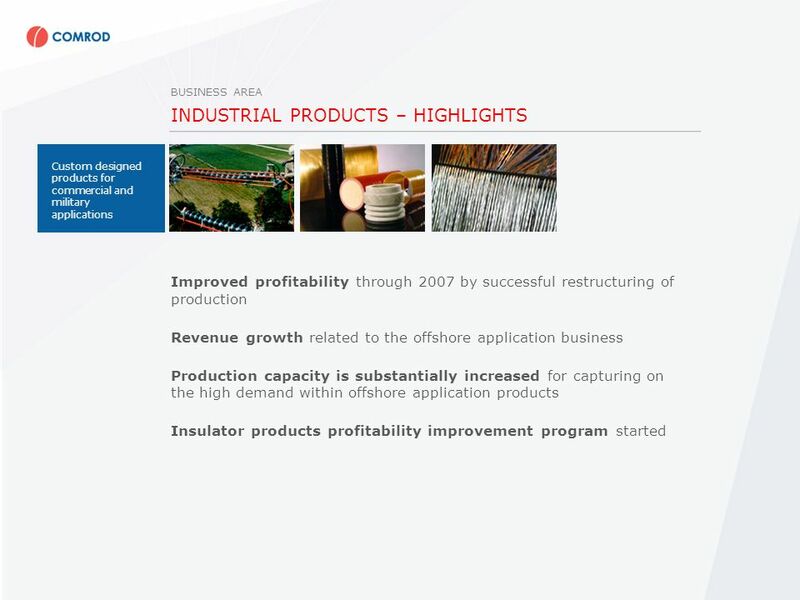 NORDIC SEMICONDUCTOR ASA Q PRESENTATION Svenn-Tore Larsen CEO 15th of July, 2004. 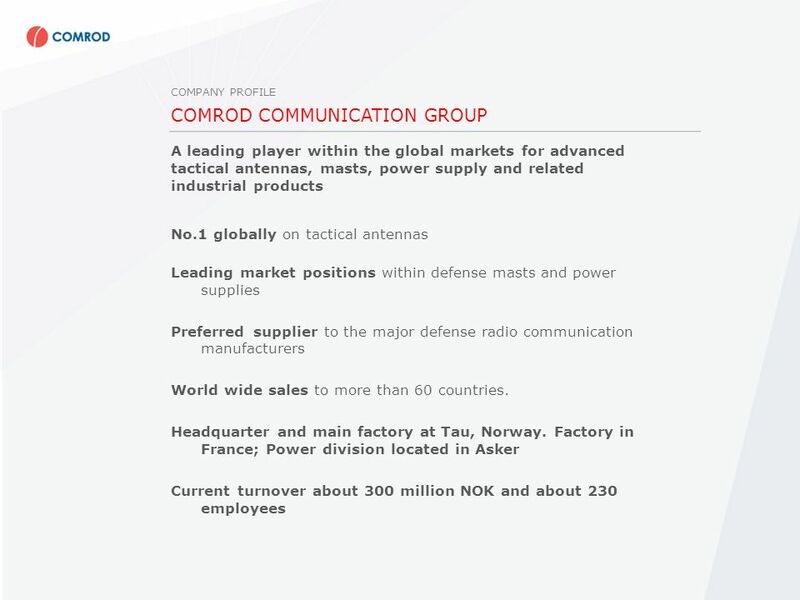 Comrod Communication ASA Q2 Presentation Stavanger, 27th. 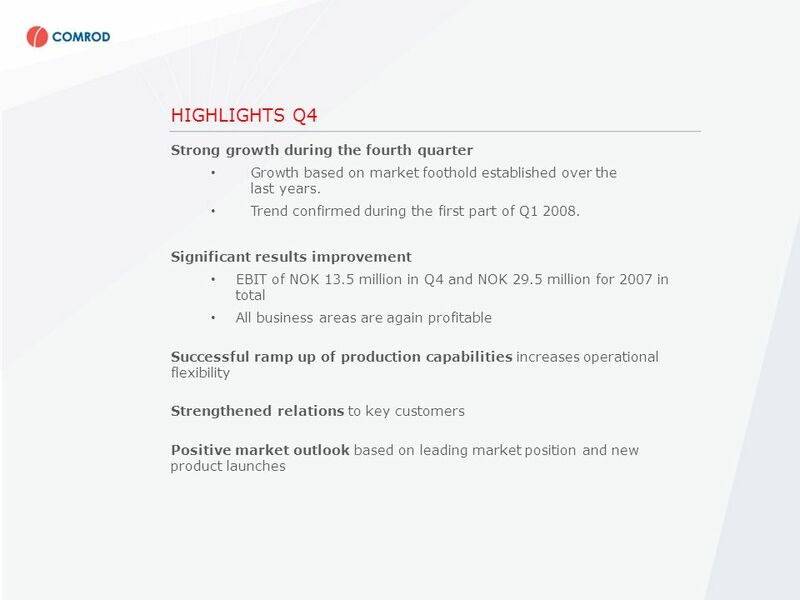 August 2007 Eirik S. Larsen, CEO Kari Duestad, CFO Ole Gunnar Fjelde, EVP and MD Comrod AS. 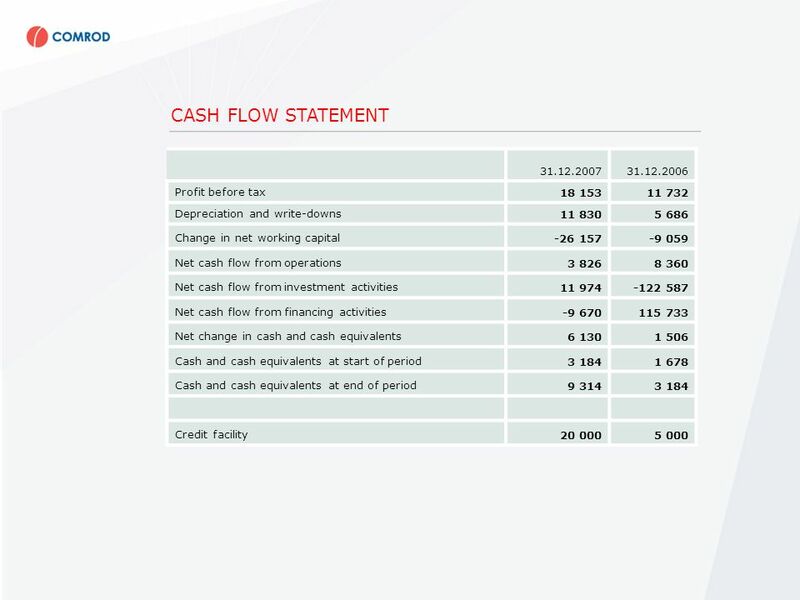 Abcabc Press Conference February 19 th 2004 Oslo Børs 1 Q4/Annual Results 2003. 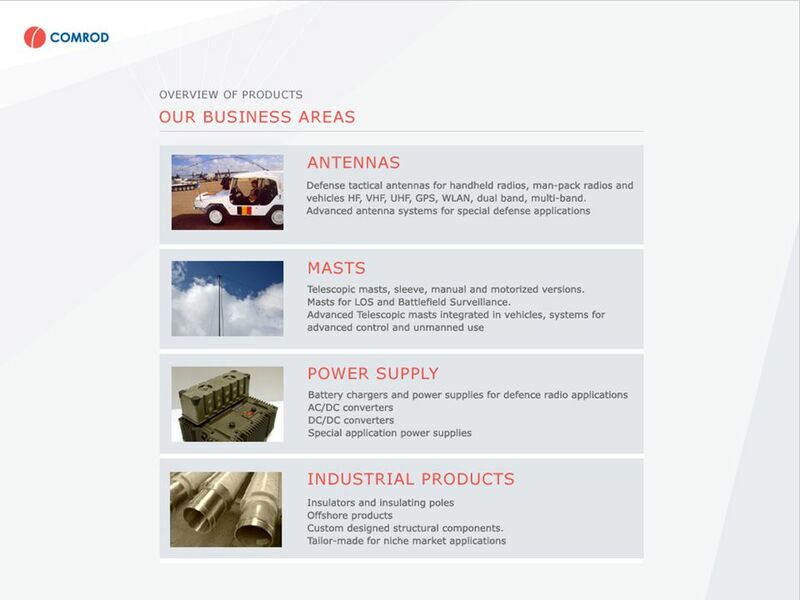 AXIS Communications - a world of intelligent networks Full year 2001 CEO Peter Ragnarsson CFO Jörgen Lindquist. 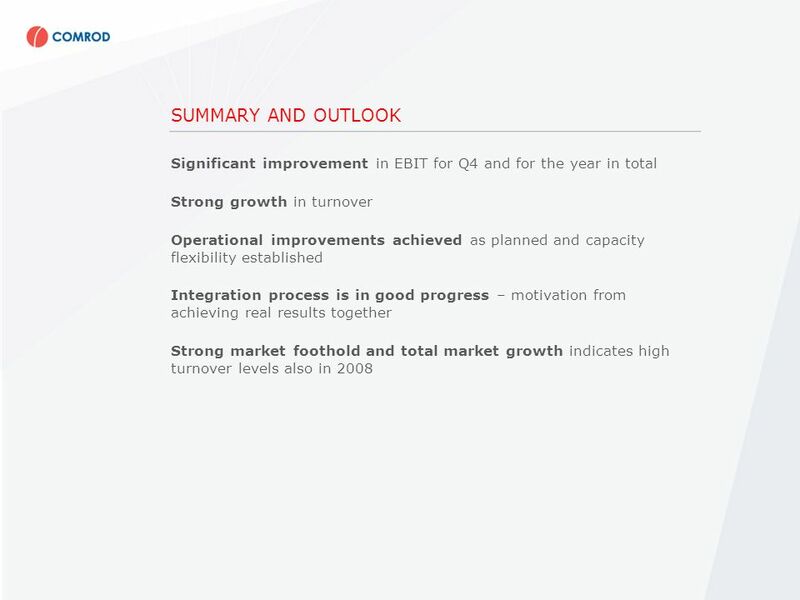 125 YEARS OF FORWARD THINKING Mouchel Annual Results 2013 Grant Rumbles, Chief Executive Paul Rayner, Finance Director. 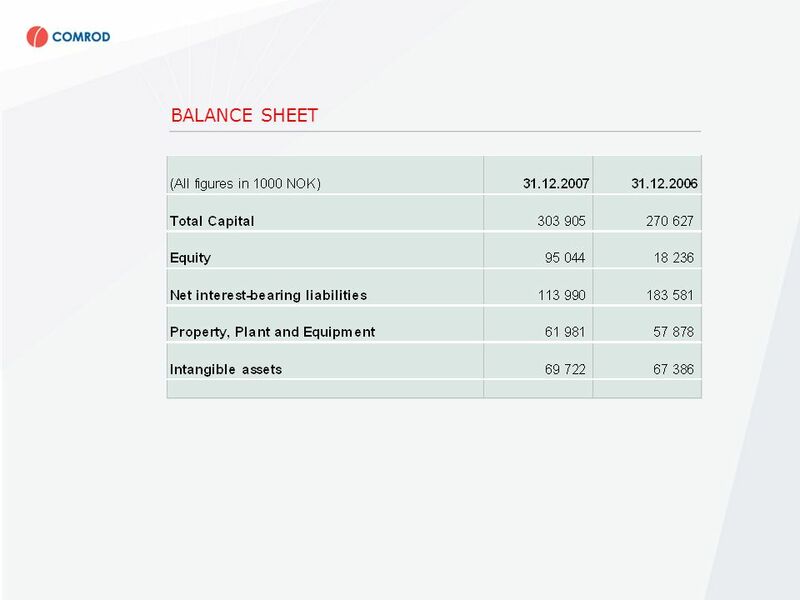 21 May 2013 Anne Hvistendahl Head of Foods & Seafood, DNB Bank ASA Seafood consolidation seen from a global leading Seafood bank. 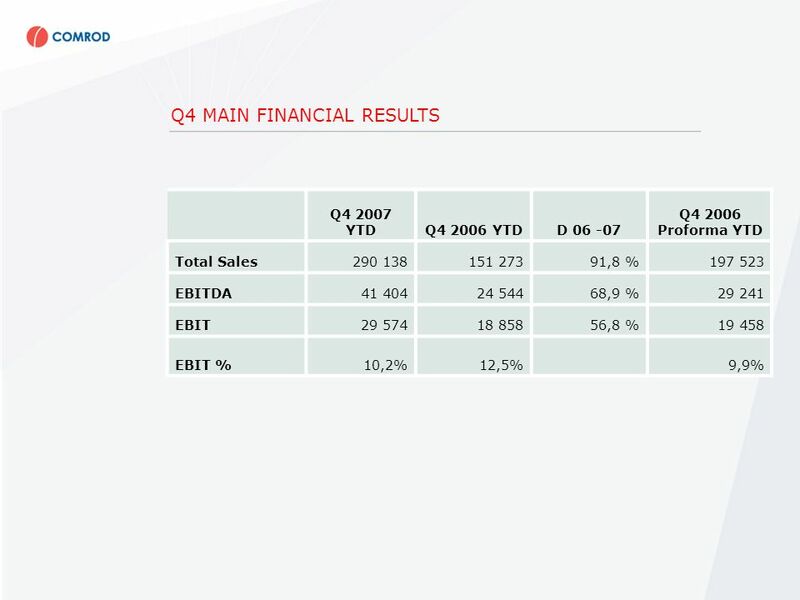 Presentation of 2007 Annual Results Neways Electronics International N.V. 26 February 2008. 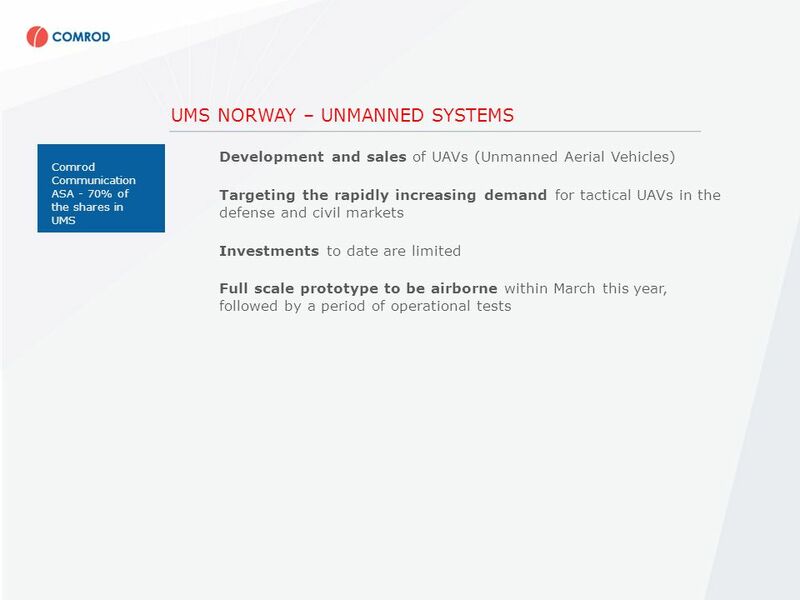 ... M A K E S Y O U R N E T W O R K S M A R T E R Interim Report Jan - Mar 2003 CEO Ray Mauritsson CFO Jörgen Lindquist. 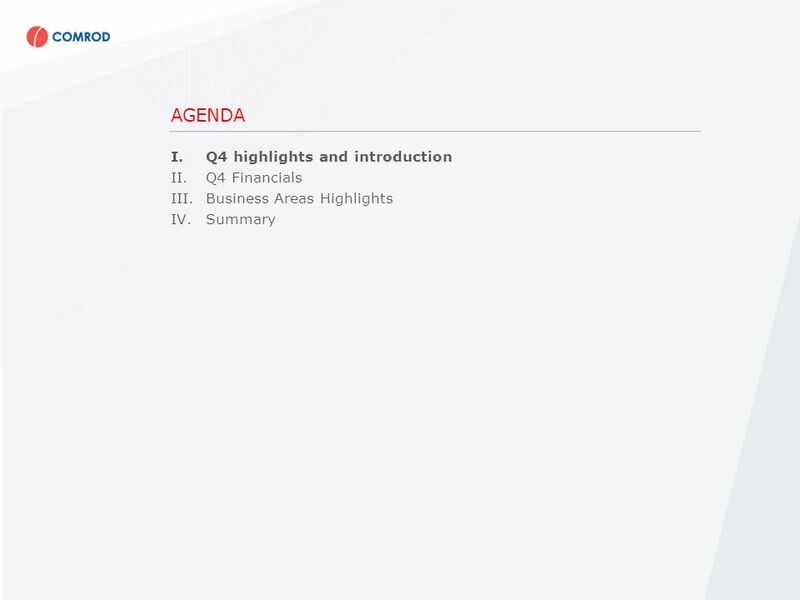 AEA Annual Results 31 March 2007 Andrew McCree and Alice Cummings 14 th June, 2007 Linklaters, One Silk Street, London.